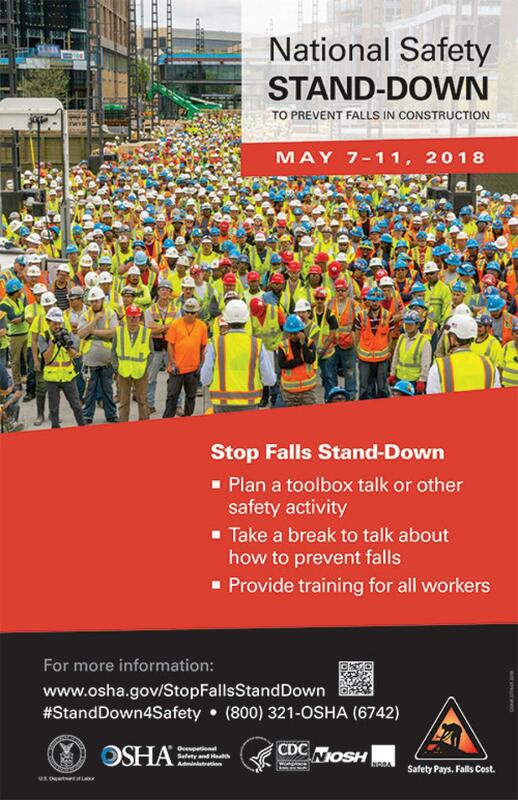 The U.S. Department of Labor's Occupational Safety and Health Administration (OSHA) will hold its annual National Safety Stand-Down to Prevent Falls May 7-11. The event encourages companies and workers to pause during the workday for topical discussions, safety demonstrations, and training in hazard recognition and fall prevention. Deputy Secretary of Labor Patrick Pizzella will attend a national kick-off event on May 7 at the newly constructed DC United Audi Field Stadium, where experts will talk about the importance of fall prevention, demonstrate proper fall arrest systems and encourage workers to participate in training. The lack of proper fall protection is the most frequently cited OSHA violation. Stand-downs provide employers and workers the opportunity to talk about hazards, protective methods, and the company's safety policies, goals and expectations. To guide nationwide and international efforts, the agency's Stand-Down webpage offers information on conducting a successful event, and educational resources in English and Spanish. Employers are encouraged to provide feedback after their events and to obtain a personalized certificate of participation. To learn more about preventing falls in construction, visit http://www.osha.gov/stopfalls/.